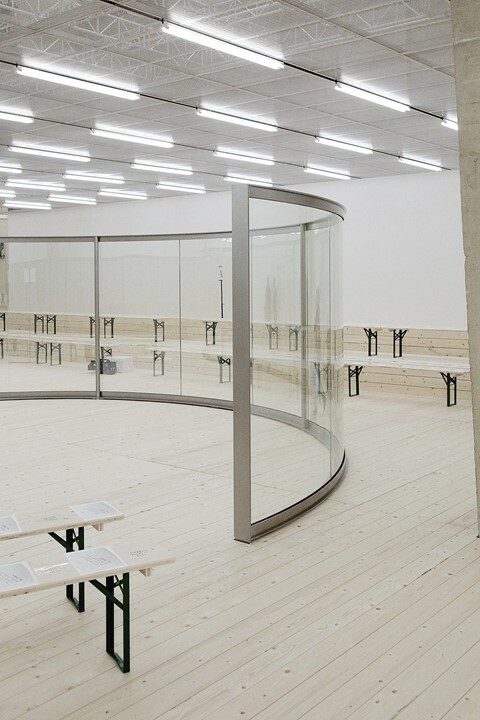 There is usually a visible parity between the clothes that Phoebe Philo sends out onto the Céline runway and the environment within which she chooses to present them – whether that’s the colour of last season’s tennis court flooring seeping into grass green trousers, or the large-scale Dan Graham installation that served as the backdrop for this season’s outing. Céline is a brand whose relationship with the arts extends beyond fashion’s penchant for a creative collaboration – after all, visit any contemporary gallery or art fair and you’ll likely find an abundance of curators and collectors dressed in a uniform of her relaxed refinement – and, for S/S17, Philo continued to consolidate her relationship with the field. Graham is an artist particularly renowned for his “pavilions” – sculptures which reflect voyeurism and human interaction or, as Philo explained, “offer an opportunity to question our present day, highlighting the complexities and contradictions of everyday life.” Such an approach directly resonates with the clothes that she designs – created, as they are, for women and their lives, rather than to fulfill an abstract concept or oblique narrative – and so the pair united in a remarkably cohesive way. “Social interaction, fantasy and life in general are the main forces in my work,” she continued – and that’s the thing with Céline: it is (a very chic fantasy) of life. This season consisted of the sorts of pieces that comprise a dream wardrobe: camel coats, nipped at the waist with frilled leather elbow patches to prevent wear and tear; silk viscose dresses complete with swooping capes that would never crease; detachable leather peplums to be layered as you wish. Seams were often left unfinished, oversized shirt dresses ready to be thrown on for an impact that was spontaneous and fluid but with the elegant modernity Philo has made her name creating. It was beautiful, and clean and, on first glance, simple – but that sort of simplicity that only really appears as a result of concerted effort on the designer’s part. Here, the complexity lay in the details of garments (a twisted strap here, a careful cut-out there), and their graceful, fluid movement when worn. While designers can all too often forget about the women who might one day pick their pieces off the rack, Philo’s Céline presented layer upon layer of elevated reality – and, with that reality in mind, her collaboration with Graham appeared a truly harmonious endeavor.